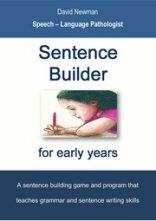 The Sentence Builder Program is a free, comprehensive 108 page resource that will help your children to learn to construct grammatically correct sentences. This program uses a combination of oral language stimulation techniques, scaffolded contextual cues, phonemic awareness cues and written language exercises to facilitate students’ awareness of phrase, sentence, and grammatical structures. These skills are developed to help scaffold students’ ability to learn to read and spell new words. The Sentence Builder program is limited to students learning 30 unique phrases and 38 individual words. Students will have multiple opportunities in a variety of different contexts to learn and relearn the target words and phrases. Once students have had the opportunity to learn the programs words and phrases, they will have increased confidence when combining the target phrases to form, read and eventually write grammatically correct and original sentences. The example depicted here is based on a real life session with a 6 year old boy with language and literacy difficulties. The initial pre-test reading assessment revealed that Charlie (name changed) was able to identify 5 words from the list of 38 words listed. The words Charlie was able to identify were a, the, at, on and is. The clinician decides to target four words from the list for this session. The amount of words and concepts to learn per session will vary for each student. Some students may only be able to effectively learn one to two words, whereas other students will cope quite well with learning up to five words in a 30 – 40 minute session. The words chosen for Charlie to learn this session are boy and girl. The session begins with Charlie working through the worksheets for each word. The worksheets take 5 -10 minutes each to complete. At the completion of each worksheet the clinician asked Charlie to write the newly learnt word onto a whiteboard. With some support, Charlie was able to write both boy and girl. The clinician begins the Sentence Builder program game. All of the various coloured grammar tiles are laid out in rows before Charlie. Charlie is handed a sheet with the coloured boxes. The rules and the sequence of the session are then explained to Charlie. The game begins by Charlie rolling a dice and matching the dice roll with the colour displayed on the chart. On this occasion Charlie rolls a 2, and with guidance from the clinician, selects a green tile. Clinician: ‘Ok that’s a green tile. The green words are noun phrases. Have a look on your chart, where should the green tile go?’ Charlie searches his chart and points to the top green bar. The clinician next places the grammar help sheet on the table. The game continues in this manner with the clinician consistently commenting on the structure of the sentence. The clinician continually relates the structure of the noun phrases a boy and the girl and their relationship to the structure the two sentences that Charlie creates. Throughout the session the clinician scaffolds each tile selection that Charlie makes. The focus of the session is on Charlie being able to recognise and hopefully write the words boy and girl at the completion of the session. A bonus therapy outcome of course is that Charlie is being immersed in intensive and specific oral language and is also learning grammar and syntactical structures in a fun and meaningful activity. With language or literacy intervention the key ingredients are repetition, scaffolded support and intensity. It also helps immeasurably to package the intervention within a meaningful context. The Sentence Builder program provides the context where the student can practice the same grammatical structures and forms in multiple combinations. At the completion of this session, the clinician once again asks Charlie to write the target words boy and girl onto a whiteboard. Without any scaffolding, Charlie produces boy and gurl, which are entered onto the rating scale and the my words list. The word gurl is incorrect, but it’s very encouraging that Charlie got close in his attempt.